A recent study concluded that Christianity's image is the United States is declining, especially among young people. Only 16% of non-Christians between the ages of 16 and 29 have a "good impression" of Christianity according to Barna Research. Evangelicals come under the severest criticism, with only 3% of 16-29 year olds having a favorable view of this group of Christians.This pamphlet was written to show this generation some of the "good deeds" that Christians have done over the past 2000 years.The Scriptures say that even non-Christians will glorify God when they see the kindness and good works done by Christians (Matthew 5:16; 1 Peter 2:12)It includes dozens of examples, from the abolition of slavery in England to advances in medicine and science. 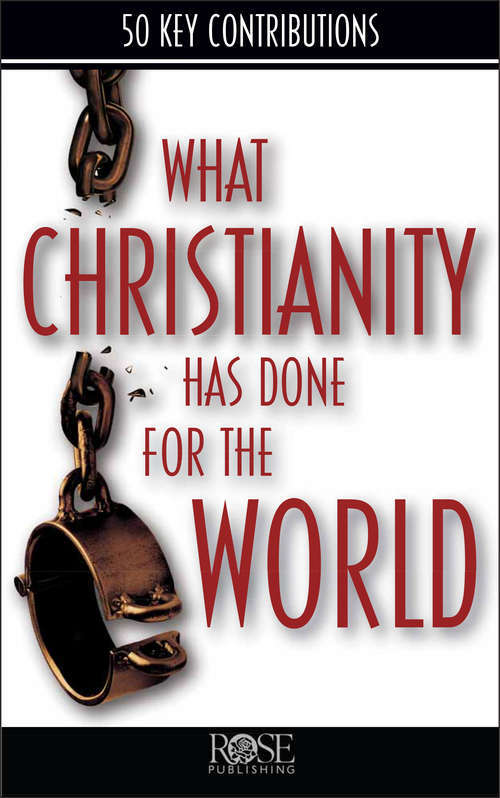 Includes specifics about educating the poor, feeding the hungry, caring for lepers, and reforming laws to protect the weak. This is a valuable reference guide--buy one for a skeptical friend and another for yourself. Examples are taken from art, literature, science, medicine, law, education, philosophy, charity, and equality for all people.